BCDB Rating: 4.3/5 Stars from 8 users. This page has been viewed 24 times this month, and 2484 times total. Cartoon Characters: Pudgie Parakeet, Grunge the Cat. Characters (Live Action): Daniel Hillard/Mrs. Euphegenia Doubtfire, Miranda Hillard, Stuart "Stu" Dunmeyer, Uncle Frank Hillard, Gloria Chaney, Lydia "Lydie" Hillard, Christopher "Chris" Hillard, Natalie "Nattie" Hillard, Jonathan Lundy, Mrs. Sellner - the Social Worker, Aunt Jack Hillard, Bus Driver, Justin Gregory, A.D.R. Director Lou, Cop, Judge, Miranda's Attorney, Daniel's Attorney, Granny "Warden" - Miranda's Mother, Alice, Thug, Stunning Woman, Delivery Boy, Ron, Bartender, Lundy's Secretary, Maitre D', Cook, Head Chef, Housekeeper, T.V. Director, Mr. Sprinkles - the Mailman, Puppeteer, "Kovacs" the Chimp, Lundy's Waiter, Stuart's Waiter, Man in Men's Room, Hostess Tanya, Woman in Restroom, T.V. Boss, Waitress, Restaurant Guest, Employees, Valets, Staring Boys. Vocal Talent: Robin Williams, Sally Field, Pierce Brosnan. Animated By Dwayne Gressky, Bill Littlejohn, Barry Nelson, Ralph Newmann, Tom Ray, Claude Raynes, Tom Roth. Written By Randi Mayem Singer, Leslie Dixon, Anne Fine. Originally Released on November 24, 1993. You can watch this cartoon today on your computer. Just click below to start viewing "Mrs. Doubtfire" online now. Do you have anything to add to this page? Have we made any mistakes... or do you have any additional information about Mrs. Doubtfire? If so, we would love to hear from you. Please send us a quick note with your additions or corrections to this page, and we will make the corrections as soon as possible! 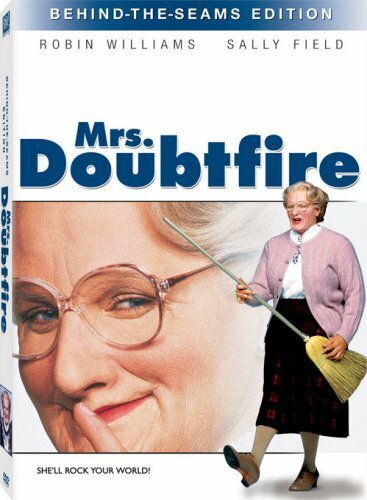 Do you love Mrs. Doubtfire, or do you think it is the worst cartoon ever? Let us know what you think! Surely you have an opinion... so share what you think. Take a minute and post your own comments about this cartoon here. Mrs. Doubtfire by Big Cartoon DataBase is licensed under a Creative Commons Attribution-NonCommercial-ShareAlike 4.0 International License.